Driving in the mountains can be a wonderful and exhilarating experience, but it can also be tiring and cause extra wear and tear on your vehicle. Here are ten time-tested tips to make any drive more enjoyable. 1. Make sure that your brakes, windshield wipers, defroster, heater, and exhaust systems are in good condition. Ensure that your brake and transmission fluids are filled and have been changed within the interval recommended for your vehicle. Brake fluid, as it ages, takes on moisture and contaminants that lowers its boiling level. Frequent brake use can overheat the fluid and you can lose braking efficiency when it is most needed. Also check the tread on your tires and ensure that they are properly inflated. 2. Don't go down a mountain road any faster than you can go up it. Don't use your brakes to hold your downhill speed. Down shift to S or L - the only time you should step on your brake pedal is to slow while you are shifting down to a lower gear. Resist the temptation of zooming down a hill. 3. On steep upgrades, downshift to a lower gear, watch the temperature gauge in your vehicle, and turn off the air-conditioning if it starts to overheat. If you need to cool the engine, find a safe place to pull off the road, park it and keep the car at a fast idle. Do not shut off the engine, and never remove a hot radiator cap. A faster way to cool an engine is to turn on the heater, but usually that option is a bit unpleasant for the driver. 4. Don't "hug" the center line. 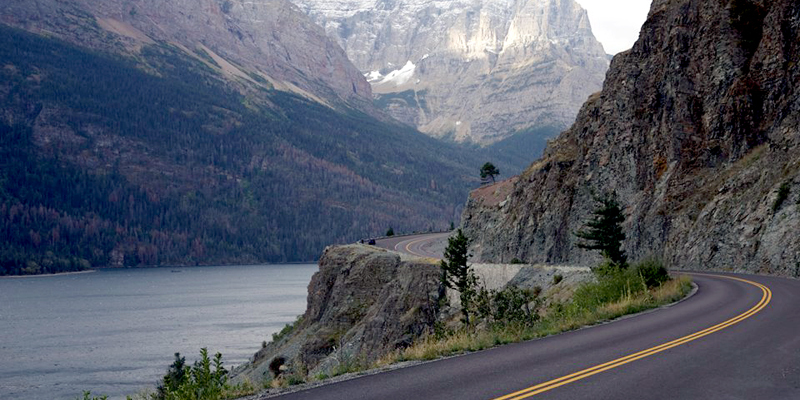 Most mountain roads are narrower than Interstate highways. Some drivers have a tendency to hug the center line, but this driving technique is both unwise and irritating to other drivers. If you are hugging the center line, and another center-hugging vehicle comes around a curve from the opposite direction, both drivers may overcorrect and create a hazardous situation. 5. Always remember that the car going UPHILL should be given the right of way. Always allow plenty of time for passing vehicles to make it back to their lane. Keep in mind that higher elevations diminish a vehicle's available horsepower, and your car may not perform as well at 10,000 feet as it does at sea level. 6. Slowing down for any reason, whether it's to view scenery or because of a steep grade, is acceptable road behavior, as long as you maintain awareness. If traffic behind you grows to more than three vehicles, look for a designated pullout and let the traffic pass. In many states, failure to allow such traffic to pass can result in a traffic ticket. 7. If you choose to explore unpaved side roads, follow these three rules. First, check local weather and road conditions that may affect your drive. Second, unpaved surfaces provide significantly less traction, so slow down and take curves on a wider arc than you might attempt on paved roads. Third, let someone know where you are going and when you expect to return. 8. Always carry extra drinking water, and remember to drink fluids throughout the day. At higher elevations, insufficient hydration can lead to the onset of symptoms of altitude sickness. Even if they're mild, they can affect your alertness. 9. In the event that weather conditions deteriorate into fog, rain, wind, or snow, slow down, be more observant, and demonstrate extra road courtesy. If other drivers appear to be in a hurry, let them pass - it may be an emergency. If winter weather is a possibility, you should add special solvent to the windshield washer reservoir to prevent icing. It is a good idea to carry chains, an ice scraper, a small broom (for sweeping snow off the car), a flashlight, a hand towel, and a small hand shovel, in case you need to dig out around wheels parked in snow. It is also important to keep the gas tank filled. Sometimes, weather conditions require extended periods of waiting for roads to be cleared, and your vehicle's engine should not be shut off during these periods. If your vehicle stalls, stay with it. Cars are much more visible in snow than pedestrians. Another courtesy to remember when in conditions of reduced visibility or at night is to dim your high beams as soon as you see the sweep of an oncoming vehicle's lights. Hampering the other driver's night vision is more dangerous when there's a cliff involved. Because navigating mountain roads can be more tiring than flatland driving, consider limiting travel on challenging roads to no more than six hours per day. Of course, the most important tip for mountain driving is, relax and have fun! You'll soon discover why so many road trippers opt for routes through mountains whenever they have the chance.